Once upon a time, if you wanted to look the part, you’d have to know an awful lot about fashion, where to buy the best clothes and what’d look good on you. These days, the internet’s taken care of all that (thanks, internet! ), due to the incredible success of personal stylist services from Keaton Row and Stitch Fix (for women) to Bombfell and Trunk Club (for men). They all tend to work in a similar way: you sign up, get assigned a stylist then brief them on your likes and dislikes. Then off they trot to source the perfect wardrobe for you, and everything arrives beautifully packed at your front door without you ever having to set foot near a pokey fitting room. It’s the future. But now! Most of these services have got where they are today on the back of personal recommendations from friends: “Wow, Zelda – you’re looking great these days.” “Thanks, Dahlia, but I’ve got all the taste of unseasoned tofu. This is all down to [insert name of brilliant web service here]. You should try them!”. 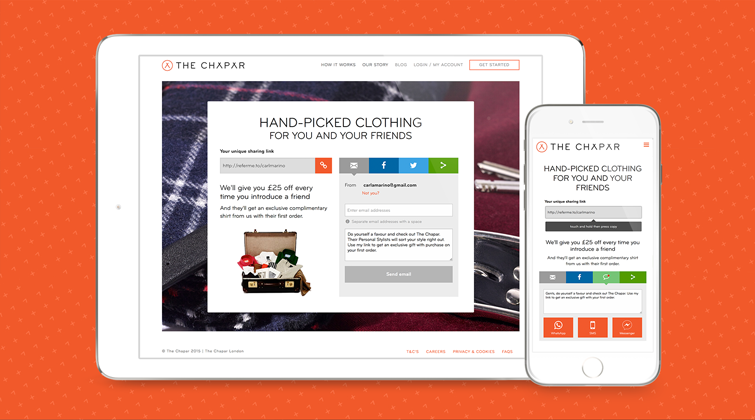 So, it’s no wonder that one of the best personal styling services around, The Chapar, should take the kind of word of mouth advocacy and work with the world’s leading referral marketing experts, Buyapowa, to seed it, fuel it and reward it online. Starting today, happy Chapar customers will be able to earn £25 off a future shop whenever they refer a friend, while the friend gets a free shirt upon making their first purchase. It’s all tracked, managed and fulfilled by the Buyapowa platform, effortlessly driving engagement and supercharging acquisition in the background while The Chapar can get on with that they’re really good at: making their customers look great. Take a look at The Chapar’s stylish programme here. If you would like to learn how referrals can work for your business or if you would like to see a demo or just chat referrals then, drop us a line. L’heure de l’ubérisation de L’Oréal à sonné ?